When foodies talk about who does the best traditional sushi in Orange County, three names will inevitably rise to the top: Shibucho in Costa Mesa, Kasen in Fountain Valley, and Sushi Wasabi in Tustin. Among those, the one that usually floats above the cream is Sushi Wasabi. Whether it is the best or not, Chowhounds, Yelpers, and food critics agree on one thing: the owner and chef is a die-hard stalwart of tradition -- a lone samurai standing in defense of an artform under attack from all sides. After all, everyone does sushi these days, or some form of it, but not everyone can be called an itamae. Sushi Wasabi's Katsu Aoyagi is, in the truest sense of the word. And he's as serious as one gets. In fact, he is so rigorously old-school, his reputation precedes him. How so? Both he and Shibutani-san of Sushi Shibucho will refuse to make you a California roll, but only Katsu-san puts it in writing. SUSHI BAR IS "OMAKASE" STYLE. TRUST ME. And trust him we did. We sat and almost automatically, our "omakase" dinner began. With his face hidden beneath a baseball cap, he toiled with quiet concentration and made eye contact only when he presented each course. When he did, he uttered a few proud words to tell us about what the item was and where it came from. Chilled Canadian albacore steaks was his first offering, soaking in a puddle of tart ponzu and sliced scallions. This was followed by big eye tuna from Tahiti -- a cut of soothing coolness that made me shiver. Any fresher and he'd need a spear and scuba gear. After that, it was a creamy New Zealand red snapper, served with spritz of ponzu. The piece, like the tuna that came before, featured loosely-packed and smaller-than-normal balls of rice. This was deliberate, since the rice was meant to function as a chaser to the fish, not the other way around. Next was the item for which he is most well-known: the blue crab hand roll. It's from Texas, he told us, and there were gobs of it -- enough to fill a cup -- dressed in mayo and wrapped with rice inside crispy nori. Sweet and unbelievably succulent, it was worth its weight in gold. About now, more customers trickled in. Soon, there would be no empty bar seats left. But Katsu-san's pace and output was not slowed. We watched in slack-jawed amazement as this sushi dynamo served ten people, by himself, remaining as cool as his cucumber rolls. His method wasted no movement, and employed fish he'd pre-cut beforehand. It is this fact, however, that provides the few Sushi Wasabi detractors ammunition against him. But pre-cut or not, the next piece he gave us was dreamy. It was the back and stomach of a yellowtail from Japan; a slab of flesh so rich and fatty, it filled my mouth like Häagen-Dazs. He followed this with a hot dish; tender scallops baked with onion strands and mayo, splashed with ponzu. Then, it was chopped toro nigiri, which reminded me of Hawaiian shaved ice since it melted cooly on my tongue like a snow cone. Afterwards, there was Santa Barbara uni. Jiggly and blubbery, the warmth of the rice hastened its transformation into a custardy mouthful of liquid. He hand-formed Scottish salmon into aerodynamic bullets, topping it with sweet sea kelp and toasted sesame seeds. Its oily unctuousness prepared us for what was to come: bulbous Kumamoto oysters from Seattle that burst like a sea-water-filled balloons. The next course that came was albacore stomach sack, which I ate without remembering to take a picture. But it, too, was doused in ponzu sauce, like the oysters. By then, I realized I'd discovered my only problem with the meal: his repetitive use of ponzu was beginning to fatigue my palate. He didn't relent with the final course, either. 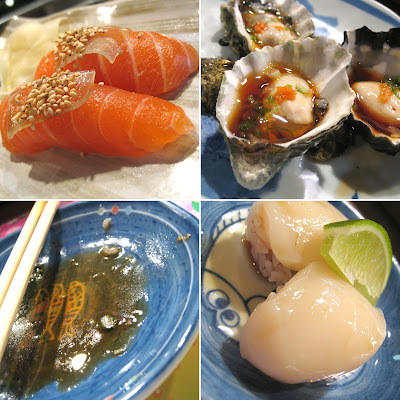 A thick and firm Japanese scallop was also brushed with the same, citrusy brew. We threw in the towel at that point -- not because I was afraid there would be more ponzu, but because our bellies were close to exploding. The total per person was $71.33 before tip, which was just about what we expected for a meal we expected to love. And we did love it...though not as much as Katsu-san seemed to love ponzu. *Want other perpectives? Read reviews by Gustavo Arellano, KevinEats, and Julian Hsu. did he use alot of Ponzu sauce? That also seems to be a complaint. Can you imagine trying to do an OCFB meetup there? We'd have to take out the whole restaurant! Now I've have got to try this place. Cost is almost comparable to the sushi joint off of Baker I can't recall the name and this place seem to server down to the root sushi. #1 Never trust anyone that says "Trust me"
#2 I order Omakase because I want to, not because someone forces me to. Kind of put off by the arrogance of chefs at times. #4 Sushi bars are like pubs. Lots of places have great food and drink. Even the same food and drink. There are many other aspects that make people recommend their special place. Same as sushi bars. I say no thank you to a sushi bar with a bunch of "rules". Customer Service is what U.S. restaurants are famous for around the WORLD. I have actually like places with great service and worse food than the other way around. When I fork out close to $100 a meal (typical sushi meal with drinks), I think that entitles me to some good service. DD: $100 probably also entitles you to some non-pre-cut fish. That's a huge turn off for me. The writer is dead on. The best sushi in Orange County truly is Kasen, Sushi Wasabi and Shibucho, in that order and by a landslide. I spent two weeks eating fresh Sushi in Japan this summer and the main island has nothing on these three sushi bars. One thing the writer neglected to mention about SW, however, is that its Omakase rotation is seasonal. I hit the place up about a month into every season to try the fresh new delights. He did. Too much. 5 out of the 12 dishes pictured had ponzu. Only two really needed it (the albacore and the oyster). If he held back, I wouldn't have had that complaint at all. Not one bit. Is it a trend you've seen in other traditional joints? I'm sort of a Shibucho regular and he's quite sparing with it. Shibutani's vice, ironically, is a heavy hand with the wasabi. Ah, you speak of Ikko. I like Ikko. Though it has the distinction of making me actually tire of foie gras. I had his omakase, and man -- I must've eaten my weight in goose liver! You won't find that at Wasabi though. Nothin' but fish! HA! I can always count on you to boil it down to bullet points. I'm like you, I'll forgive so-so food if they bend over backwards on the service. Don't get me wrong though, Katsu-san is no Sushi Nazi. He may be precise, but he's also polite and professional. His wife too. She whisked away empty plates and refilled glasses without us having to ask. Those written "rules" of his might sound presumptuous and arrogant to some, but I read as his way to say that he knows what he's doing (and he does, except for that ponzu thing). From what I've read in other blogs, he's a softie. Though, I'm still not going to ask him for a California Roll. I wasn't put off by the pre-cut fish since his slices are pretty-darn close to surgical. On the contrary, I've been to sushi bars where the fish was cut in front of me, and it looked like it was mangled by hacksaw. Seasonal, eh? Well, that's reason enough for me to make a return visit later in the winter. My wife and I ate there the other night with our son (daughter was at a sleepover with a friend). It's still my favorite place for sushi, having been going there regularly since moving behind the curtain. I knew it! He's a softie! I admit I have not eaten there. I have my favorite place which is Kingyo Sushi in Newport Coast and on the side where Tomo serves. I havent eaten there because of all of his messages on his signs. I saw them in person adn was so turned off. Truly great people, who are masters of their craft, don't have to tell people how great their product or skills are. And pre cut fish???!! NO way. I promise you that affects the taste as more surface area is exposed to air as well as vessels and conective tissues that have ruptured from slicing and are "aging". Its not a minor point and for those prices I would expect more. But I admit that I have never eaten there. But then again I have never eaten 1000 year old eggs, but I dont need to eat them to know they are probably asstastic. He does use a lot of ponzu, but since I love ponzu I can't complain. :) Also, Katsu goes to the LA fish market every morning at 5 a.m. to select fish for that day. Freshest sushi I've ever tasted. I'm not turned off by the signs. He's simply explaining what omakase is so that people won't walk in off the street and start making demands. Sniffle. It's been years and I've only been twice but Sushi Wasabi is the best I've ever had. I am sad that his use of the one-two-ponzu punch was a bit overwhelming, or at least, too repetitive, but I am glad that the sushi was still fresh and otherwise to your standards E.
How can this be traditional sushi if he pre-cuts the fish? Plus @ $70 a person, I want to see him slice the fish himself. Maybe he needs to hire another chef? I had Sushi Gen this weekend in Little Tokyo. Sat at the bar, order almost every fish available, plus 2 orders of sashimi (yellow tail/blue fin, 2 large Sapporo's for $70/per person. Sure I have to drive to LA, but so worth it. How can "going to the fish market every day" even remotely be considered something special???!!! So many Sushi chefs do this. Almost all of the ones I have encountered. Its like if you were a surgeon and said "I wash my hands before every surgery"
Having "fresh fish" is not something "special" rather its something that I consider "inherent" to a sushi bar. Its like saying "I drank this Coke and its was really bubbly"
And it doesnt matter how fresh the fish is if its pre cut, exposed to air and is changing in flavor and texture as it sits. Nah, he just likes ponzu. No, make that he LOVES ponzu. The fish is very, very fresh. Aside from the ponzu, Wasabi is one of the best traditional sushi joints I've ever been to. But let the record be set straight: thousand year old eggs are delicious! DD, no hard feelings pal. I'm happy to live and let live. I'll even add Kingyo Sushi to my must-try list. And of course, we agree on Ambrosia. And the fact that 1000 year old eggs are asstastic (I actually ate these thoug). I, on the other hand, have had the misfortune to repeatedly eat sushi from chefs who most certainly did not visit the fish markets that morning. Kar and I eat at Urasawa, Nozawa, Zo , Gen , Mori , Hiko all the time but when in OC the best are what you said. Wasabi, Shibicho, Kasen which I've been going to long before most even knew it was on the Planet. Some of the Posters have recommended other Sushi places like Frenzy which was so bad I'll have a hard time ever believing another post they write but other than that there is limited fish available so anyone who thinks going to the Wholesale Fish Mkt is common place is dead wrong! I'm there several times a week and almost no-one is there! Not you too! ;-) Thousand year old eggs are one of the best things I've tried recently. Ate it straight up with silken tofu and green onions at this place called Earthen in Rowland Heights -- truly one of those revelatory food moments of my life. Wished I took a picture though. But yes, let's live and let live on this SW thing. Obviously, DD is not one to budge and we who've eaten Katsu's fish aren't either -- we know it's good and that's enough...there are a lot of other fish in the sea (pun intended). I was wondering when you were going to chime in. You, sir, are owed thanks from Katsu-san. It was largely because of your recommendation that I think a lot of people flocked there. i still have yet to try this place although everyone has been telling me to eat it. i keep going to all you can eat sushi place(as now they're a dime a dozen). at least i have somewhere to eat tonight. holler. Most of the better Sushi Restaurants PRE-CUT their fish so they can "brine" it. It's a certain style and gives the fish a better texture. As far as the excessive use of Ponzu , Wasabi wins but man is it good! I normally drink it when the Albacore is gone. Katsu makes it fresh from Sudachi & Yuzu. I knew when I saw what place you were reviewing, the comment box would be interesting. And where would Sushi Murasaki lie? I know I often talk about Yelp! but I have to note that Murasaki is the top rated omakase on Yelp and has never moved from that spot since attaining it. If you haven't tried it Edwin, please, please, please do. Please. The chef and his son are traditional and are true artists. Best birthday dinner of my life. I've heard about the chef at Wasabi, and the sign, and yes, his endless use of ponzu (the heavy wasabi I would LOVE though). The other complaint I hear is that, unlike what commenter steve indicated, the omakase is NOT seasonal, it is the same every time you go (according to people who went 3 or 4 times before giving up). To me, that is not proper. Now there's something I haven't tried: AYCE sushi. Maybe it's time for me to get over my nervousness about it, just like I realized one day that rotating sushi bars can actually be good. Thanks for pointing that out. I remembered reading that most of LA's itamaes of some acclaim use pre-cutting as a technique (not just a time-saver), but I couldn't find names. Thanks for sharing them with us. I saw Sushi Murasaki's 70 reviews on Yelp (which beat Sushi Wasabi by 20) before I wrote this post and finally got curious about it. Though it wasn't until your comment just now that I actually read some of the reviews -- most importantly, yours! The last time you mentioned it, you were considering it for your birthday dinner, and now that you've mentioned it, I'll consider it for mine! Because I trust you too! I think Shibutani is more traditional. A heavy hand with ponzu seems to be a response to the American palate, which requires heavier flavors. The sushi places I've been to in Japan are more sparing in their use of it. I still love Sushi Wasabi, though. In response to Diamond Dog's point about service, I think he's confusing different types of sushi bars. 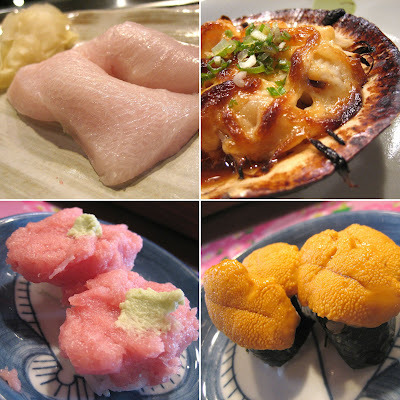 In Japan, there are several different striations of sushi restaurants. Like Sushi Shibucho and Urusawa, Sushi Wasabi fits the artisan model, not the pub model more common to American sushi restaurants. 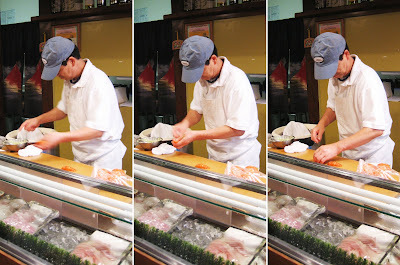 When you take a seat at an artisan sushi bars, you're paying for the privilege of being served by a master craftsman. The omakase requirement is a response to the demand for his services. Space at the bar is at a premium, and is reserved for those who are willing to appreciate the artistry as well as able to pony up the dough for it. As Julian pointed out, there are no ordering restrictions for at the tables. Diamond Dog for might be happier frequenting one of the lesser sushi establishments that substitute style and fawning service for true gastronomic substance. At the end of the day, he's going to have paid for overpriced, mediocre sushi, whereas my tongue and wallet will be singing my praises all the way home from Sushi Wasabi. That surprises me then. If I had to bet on an itamae who would surrender his left nut before he kowtowed to Americanized tastes, it would be Katsu-san. Though my preference is Shibucho, if only because I'm so used to him now, I still respect Katsu-san. His fish just seems to sparkle brighter -- and I don't know why. But Shibutani does a killer salmon skin roll (which speaks to his willingness to step out of the nigiri-comfort-zone)...Aw heck, they're both great. But Chubbs! Does this mean you have a Sushi Wasabi post of your own in the works? I wait with breathless enthusiasm and anticipation. We need to go Shibucho, too. Also Ango-tei, 'cause Deb asked me about it the last few times we met. Plus, we were gonna drop by Sushi Sho up for that natto-kimchi roll I told you about. I love Sushi Wasabi, and Katsu is really a softie at heart. He and his wife are wonderful people - he is not arrogant as some have cited. I can see why he needs the signs because I have seen people coming in, asking for cut rolls and miso soup. For the dissenters out there who haven't been, I'm glad that you're out there because I, for one, would not want this place to get out more than it has. So, please stay away and don't try it. Wasabi is busy enough as it is. I have never been to Japan so I can't vouch for what sushi is like at the Tsukihi Fish Market. But I have grown up eating sushi in LA and eaten at high-end sushi restaurants in NYC/LA. I still love Wasabi for the freshness of the sushi and his preparation, using the ponzu or not. Thank goodness that this place is in the OC and so accessible for us. Personally, I would never pick service over food because I am a foodie at heart. But I don't know that Wasabi compromises on service - they are as gracious as their sushi is sublime. For Wasabi aficianados, I am not surprised that you're out there because I see lots of familiar faces all the time. For those who want to try Wasabi, you won't be sorry. For those who are dissenters and haven't been, please, please continue to patronize other places like Ikke/o (sp?) and don't come here. BTW, you can get a form of fois gras but the monkfish variety. It is so creamy and so yummy. This is seasonal so I think that he can get it during winter time. I'm up for a sushi crawl. Except I heard that Angotei changed hands recently. Anytime! And if you are the same Beach that took my food friends and I to Pagolac, I thank you for sharing *YOUR* food finds. If you are not, then, still I thank you for the nice comment. Well said! I like the cut of your argument. Yes I am the same "Beach" that went to Pagolac with you. I have not seen CP for a while. Maybe I will tag along with both of you to try a new Sushi Bar. Ango Tei is good but not great. I was hoping it was you! Yes let's do a sushi run soon with CP. Although I am starting to read reviews that Kasen isn't what it used to be. I pick service AND quality of food when it comes to sushi. Frequent lesser places? You have to be kidding me. Perhaps you should try some more "elevated" places that provide both? Privilege to be served??! Give me a break. Like I said, its so pointless to argue about sushi places as there is so many other factors that people consider when recommending a place. People are very passionate about their sushi places and its very personal to them. You are never going to convince someone differently about one of the places they frequent. Omakase is not that rare. And it seems like some of you are getting caught up in that? The pictures of the sushi in this review showed nothing special. Look at it. I bet it was OK and good, but I saw nothing unique (ingredients or presentation) or spectacular, which would make me want to go. Knowing that its pre cut just makes it that much worse. It is a laugh that he does not serve a California Roll when he serves crab handroll with mayo. 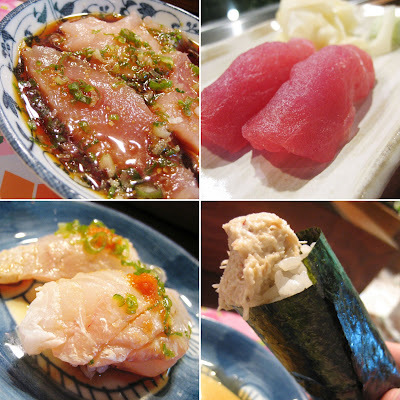 The traditional sushi in Japan do not use Mayo for that matter ponzu is used very rarely ad well. It is used often in US because it hides many fishy taste and smell to cover up the non-fresh fish. I went to this restaurant once and could not stand it. It calls it self wasabi and uses terrible powder wasabi that was so loose I could not use it. I think we misunderstand true omakase with sushi chefs' ego.